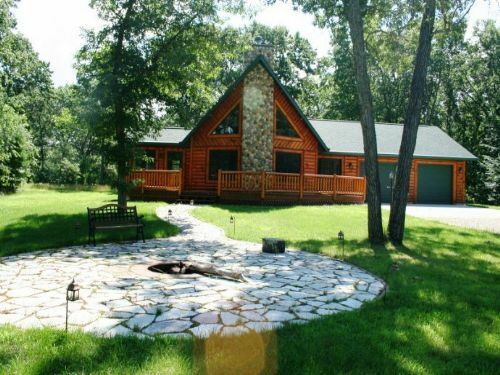 Gorgeous log home in beautiful setting on 3+ acres less than 650 feet from the deeded access to Lake Petenwell. Stunning interior features cathedral ceiling in great room with floor-to-ceiling stone fireplace, hickory floors & huge loft that serves as 3rd bedroom. Private master suite has jetted tub & stall shower. Exterior features include fire pit surrounded by huge slate patio, & lawn sprinkler. Other amenities include lower level family room & office, wiring for surround sound & over-sized heated garage. About the Lake: Lake Petenwell is Wisconsin’s 2nd largest lake at over 23,000 acres. The lake is over 14 miles long and 6 miles wide. Lake Petenwell is a tremendous fishery where you can enjoy fishing for healthy populations of walleye, muskie, northern pike, crappie, small mouth bass, bluegills, and catfish. With the low level density of shoreline development this lake provides a Northwood’s feel and there is always plenty of room for recreation. There are several bars and restaurants on the lake to eat or drink and plenty of beaches to enjoy a cookout or meet your friends. About the Area: If you want more than just the lake, enjoy all the recreational activities that Juneau County has to offer. With over 97,000 acres of recreational land (half of which is in the Necedah National Wildlife Refuge only 10 minutes away), you will have plenty of opportunity to hunt, hike, bike, bird watch, snow shoe, or cross country ski. With over 68 miles of dedicated bike trails in the area you will have no shortage of biking opportunities. Most of the town roads are also ATV & snowmobile friendly. In addition to road riding you can enjoy over 125 miles of groomed snowmobile trails in the winter. This lot is located only a couple miles from 3,500 acres of County Forest where you can hunt, hike, or just take in all the wildlife. If you are into golf you can hit the links at one of several fine local courses. You will never run out of recreational activities in Juneau County.